What kid doesn’t want to be a superhero? Especially this year – between the Avengers, Black Panther, and Ant-Man movies, everyone’s feeling inspired. Now, when you gift someone littleBits, kids (or kids at heart) can become their own superheroes. littleBits are electronic building blocks that help teach kids block-based coding and advance through programming fundamentals such as loops and logic. In this specific kit, the “bits” snap together to build a customizable high-tech hero gauntlet. Gauntlet features include wearable tech sensors (including an accelerometer), customizable LED Matrix light design, and Avenger’s sound effects. 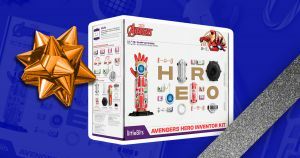 “From creating circuits to introducing super powers like stealth mode, rainbow control, power boost, and more, the Avengers Hero Inventor Kit teaches kids about STEAM [science, technology, engineering, art, math] in a fun, accessible way,” Ayah Bdeir, founder and CEO of Littlebits, said in a statement. littleBits connect with a free smartphone or tablet app that lets users enter “hero training” led by Avengers members. Users control their gear and access 18 activities via the app, all themed around the Avengers, including the Hulk, Black Widow, Black Panther, and Shuri. The kit retails for $149.99. And remember, it’s never too early to teach kids to code.